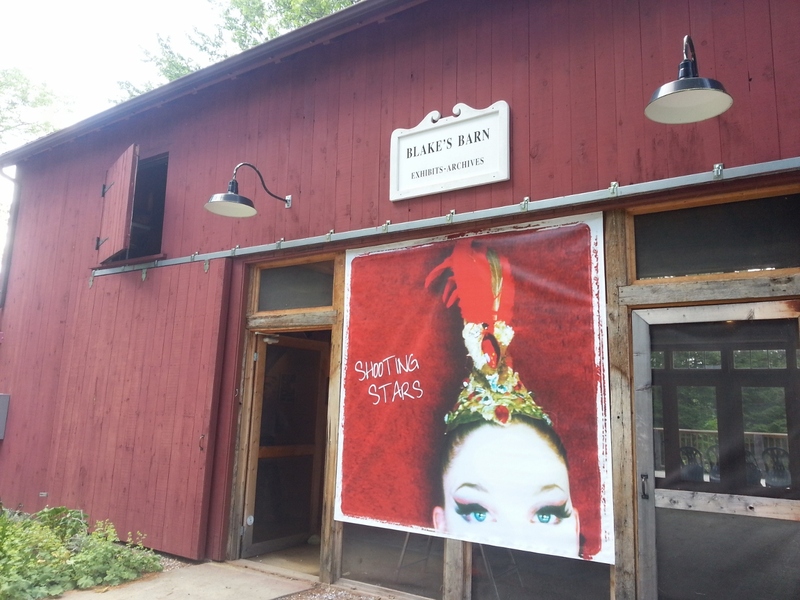 Blake’s Barn, home of the Jacob’s Pillow Archives. I arrived at Jacob’s Pillow the week before the huge Gala event that opens the summer Festival. The Gala is a ticketed, fancy event with drinks and mingling, a series of epic performances, fine dining and then dancing into the wee hours of the morning. In prep for this, the grounds were being groomed with flowering plants and the paths resurfaced with clean white gravel. Wooden signs taken down in the off season were being restored to their rightful places and refreshed with paint, and the staff buzzed in all directions with constant activity, trying to ensure that everything would be prepared properly for Saturday’s Gala. Then came the rain! Not a few hours of rain, or a night of rain – rain sluicing day and night, day and night, until it felt like it would never end. The grassy lawn where the guests would be enjoying wine and refreshments on Gala night became instantly mucky and slick, the parking lot became pitted with holes from standing water, the tents went up but many of the preparations fell far behind schedule. And yet, the Gala will still go on, even if everyone is in galoshes, because that’s what performers and performance venues have to do — go on! I’m reminded that this is also true for archivists. There are often many challenges when working in performance archives, and yet archivists have to do the best they can no matter what. Our performance in the archives, no matter the conditions, directly impacts the research and viewing pleasure of our patrons. In the face of so much rain, I watched the staff here at Jacob’s pillow rally and persevere, and it has inspired me to think about my archival projects as works that can reward the audience in a similar way as the live dance performances that will take place here during this summer. The rain did not impede my projects in the archive, and (thankfully) I am not required to perform perfect fouetté turns en pointe as I work in the renovated hayloft scholar-space in Blake’s Barn, but whatever challenges may arise in the coming weeks, I will follow the example of my peers and meet those challenges, for I too must go on! The Ballet Program students did a phenomenal job as the opening act of the Gala performance. We also saw the technically demanding Black Swan pas de deux performed flawlessly by Michaela DePrince and Samuel Wilson of Dance Theatre of Harlem, followed by Wendy Whelan and Lloyd Knight performing a piece by Martha Graham that took my breath away. Then the closing performance by Michelle Dorrance, this year’s Jacob’s Pillow Award winner, invigorated the audience and touched all of our hearts. Any one of these performances would have been a night to remember — seeing all four pieces in succession left me exhausted and tearful with joy. I’d also like to add a quick note about Michelle Dorrance. She is incredibly inspiring to me, because I studied tap for many years growing up, and I was actually pretty good at it. Eventually in high school I chose to give it up for other pursuits, and I wonder if that might have been because I had never seen a professional tap dancer perform, or heard of any tap dance artists that were women, and so it never occurred to me that it could be possible to make a career out of my tap dancing. I am so pleased that Michelle Dorrance is bringing the essence of American tap into the modern day front lines in such a big way, and I hope millions of young people see her and are inspired to follow in her footsteps. What an outstanding performance she and her vocalists gave during the Gala evening! I was moved beyond words. Check out more of Michelle Dorrance’s work at her website: http://michelledorrance.com/. I have had such a warm welcome here at Jacob’s Pillow from the very first moment I arrived. In this short time I’ve already learned a great deal about dance materials and archival work, as well as dance history and the history of this institution as I have started my first projects under the supervision of Norton Owen, Director of Preservation and resident guru on all things Jacob’s Pillow. More updates on our projects to come! Be sure to “like” Jacob’s Pillow Dance on facebook for more great photos and updates of the dancers and companies coming here to the Massachusetts Berkshires for this year’s Festival. Many of the not-to-be-missed photos posted there are by Christopher Duggan, the resident photographer at Jacob’s Pillow. I share all this simply to say that incredible things are happening here in dance and in the archives, and that this will truly be a summer to remember! This entry was posted in Dance, History, Jacob's Pillow Dance Festival and tagged Ballet Program at Jacob's Pillow, Christopher Duggan, Dance Theatre of Harlem, Lloyd Knight, Martha Graham, Michaela DePrince, Michelle Dorrance, Samuel Wilson, Wendy Whelan. Bookmark the permalink. Fabulous photo of the Gala “big top”! I’ll have to see what we have @ NYPL on Michelle Dorrance. P.S. I work with Eugenia Kim here, she’s a treasure. You’ll enjoy working with her! Thanks Selena! I’d be interested to learn what you discover about Michelle Dorrance in the NYPL collection. I’m also really looking forward to meeting Eugenia!